Half a week gone. Ready for a laugh? Last weeken when she was digging in the fridge, she found a bunch of Chives(daun kucai) that is going to rot if not used soon. What to do ah? Wanna fry egg too much pulak. Okay okay ...make Chives Chai Kueh la. Not sure what's the ingredients for the Chives Chai Kueh coz usually when she bought from the Pasar Malam, its Papa who ate it geh. Pakai hentam la...just stir fry some mushroom, minced meat, dried shrimps and chives together with a bit of oil, salt and pepper should be okay gua. Then dig dig dig...ALAMAK.....what happened to the packet of Tang Mein Fern(flour). Thought still have some at home geh...where did it went? 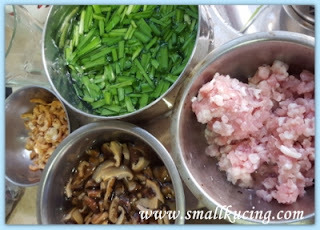 Errrr.......checked in a blog...saw one lady used Rice Flour instead of Tang Mien Fern. Okay la....hentam . Just hentam 1 cup of rice flour and half cup of tapioca flour, add some oil and salt. Pour in super-duper hot water. She got a very sticky dough. 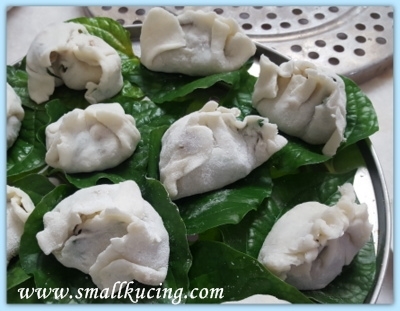 Roll the dough bit by bit into round shape but not before spreading generous amount of flour on the table. Used a cup as cutter to cut the round shape. Stuffed the ingredients into the "skin" and seal it. Hmm....now the problem. No banana leaves to layer wor...how ah...but we have abundance of daun Kadok in the garden. Plucked some. Again pakai hentam and put everything into the wok and steam la. "Oh my kucing.....", she said. The whole house stinks reeks smells of daun Kadok after like 15minutes of steaming. She is not particularly like the smell of daun kadok but Papa is okay with it. Anyway...when the steaming is all done and the kueh is cooked, it was Papa who finished off the whole tray of Chai Kueh. When Mamarazzi asked whether the Chives Chai Kueh tasted okay ka...he was surprised...huh? got Chives in it meh? I think Papa had invented new way of eating Chai Kueh. He ate it with the Daun Kadok too. Nothing left for me when I came back from school But I don't mind la. I get to eat mango. 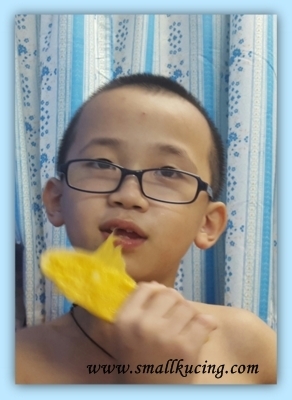 I love to eat mango and I discovered that the seed is the sweetest part of a mango. As a Teochew, I love to eat Chai Kueh very very much with the right chilly sauce. It is so difficult to find them selling in KL. If Mamarazzi open gerai to sell this, let me know. Need to work on the shape...but I am sure they taste real good. Anything home-cooked sure to be the best, lots of the best ingredients! I believe it tasted good to eat with Daun Kadok. Papa Kaldip is becoming a tortoise soon to wrap with any leaves. Next he will wrap with sireh, pandan and lemongrass!!! Whoa! Ha ha ha....I really enjoyed this post very much. Anyway, Mamarazzi is a super cook, just hentam and everything turned up well and nice. I love chai kueh very much but I am too lazy to learn to make them. If I have extra chives, I will use it to fry pancake with dried shrimp-the easier version for me...lol! Yea chai kueh cant eat much...that is why it isnso troublesome to make or rather malas to make. Good lah, the chives were not wasted. 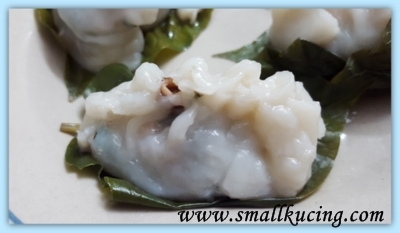 I wonder if got dim sum made using daun kadok. New recipe mah. Chai kueh! I like it. 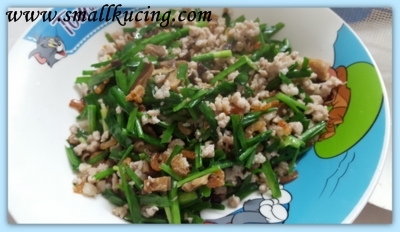 With taufu, chives or salted mustard, I enjoy all. Mamarazzi very talented, can make chai kueh. Salted mustard? How to make? Can teach please. fuyoh sounds so hebat leh, kucai chai kueh ni... not something easy to make woh, and also not many people (know how to) make these traditional kueh already, hor?? roughly there gua those ingredients?? got meat got mushroom got chives, actually if not making chai kueh, also can wrap them with lettuce hor?? like that more senang la.. and then good to go with rice also leh like that..
Lettuce. Liddat become ju hu jar? I agree with the 2nd comment....anything home cooked is the best. These sound wonderful. They look very good. I also like mango! I know what to do with the daun kaduk in my garden. Nice invention. Chai Kueh not my favourite but mango is. Love sweet mango especially. Mamarazzi and her experiment in the kitchen. Hehe. Well done! I did this on Tuesday night using Tang flour and Tapioca flour and it was not that difficult getting the dough right, only needed to work on the "packaging". Ya no tang mien fern else will look nicer. Wah, chives chai kueh....not easy to make oh. Huh, paparazzi can't taste the chives? I love chives, more chives, please! Why not eat the daun also haha. Good for health one. Better then using banana leaf hor.